There has been a rumor that slave tunnels are under a mansion in Tuscaloosa. A news crew investigated the story in a three-part video at the bottom of the page and found out what they discovered. 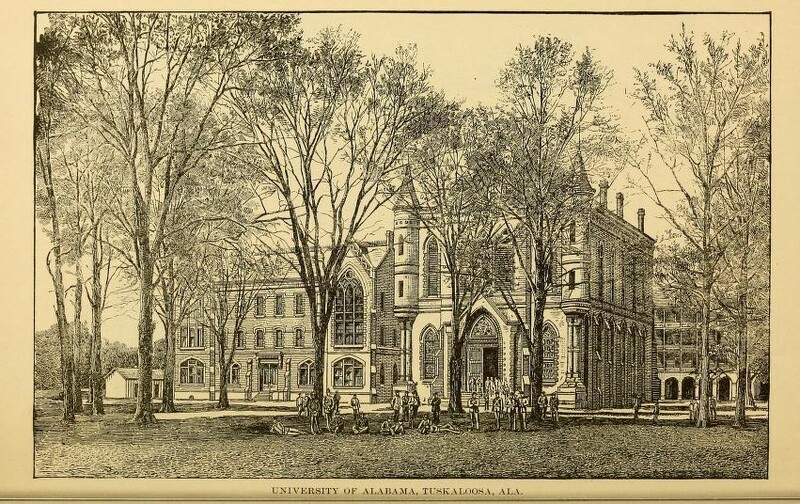 The information and illustrations below are excerpts from a book written in 1887 as a prospectus for future investors in Tuscaloosa and reveals much about Tuscaloosa’s /Tuskaloosa’s early history. Did you know that Choctaws once claimed the Tuscaloosa area? 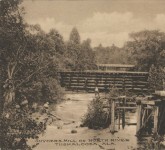 The region about the Black Warrior, where Tuskaloosa now stands, was in time long past claimed by the Choctaws. When De Soto crossed the Black Warrior on his memorable expedition in the year 1541, the Choctaws doubtless held all the region around Tuskaloosa. But as the Creeks and Choctaws were perpetually at war, and the Creeks were the more warlike and aggressive of the two tribes, the Choctaws were gradually pushed further towards the West, and the country about the Tuskaloosa River became a neutral, or, rather, debatable ground between the two tribes. 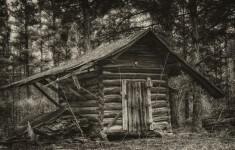 Did you know there is an actual documented case of cannibalism in colonial Virginia recorded by one who participated in it? Read about it in the Historical novel Faith and Courage. 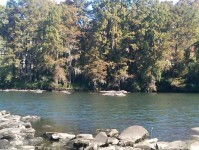 In 1809 a Creek chief, Preechee Emathla, built a village below the falls of the river. The site of this old Indian village was west of Newtown, on lands which are now the property of J. M. Van Hoose, Esq. This town was destroyed by a band of Chickasaws, under the command of Col. John McKee, in the year 1813. In 1816 Emanuel York and John Bartow, two white men from Tennessee, settled on the plain where now stands the city of Tuskaloosa and raised a crop of corn. 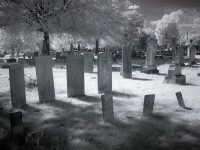 In 1818 the population consisted of 600 souls. The next year the town was laid out by the general government, lots were sold and the town increased rapidly in population. In 1835 Tuskaloosa was chosen by the State Legislature as the seat of government. The first session was opened in November, 1836, in Bell’s Tavern, now the Washington Hotel. 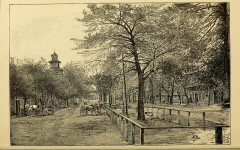 A site for the capitol was selected, and work on it commenced in 1827. In the same year the State Bank was located and its erection commenced. The building is now occupied by J. H. Fitts, Esq., as a residence. To provide for the temporary accommodation of the State government a two-story frame building was built, in which the sessions of 1827 and 1828 were held. 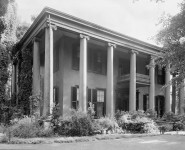 In 1829 the Legislature for the first time occupied its new house, and continued to meet there until the removal of the capital to Montgomery, in 1845. Tuskaloosa had been the capital of the State just twenty years. 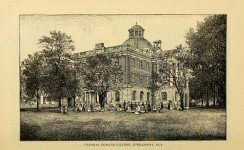 The State University, whose first endowment consisted of 14 sections of land, reserved for that purpose in the Act of Congress admitting Alabama as a State, was chartered and located at Tuskaloosa in 1821, but not opened until 1831. The University grew and flourished from the first. After it had been made the capitol of the State, the young city grew rapidly. Many of the owners of the rich plantations on the bottoms of the Warrior and Tombigbee rivers, and in the famous “Black Belt,” made Tuskaloosa their home. The erection of handsome private residences distinguished this period. The present residence of Hon. H. M. Somerville, shown in one of the illustrations, was erected in 1830 by Capt. Deering. It served on several occasions as the gubernatorial mansion. 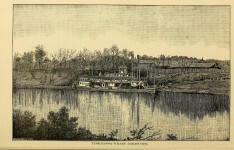 The trade of the city increased rapidly with the increase of population in the surrounding country, and in 1845, when the capital was removed to Montgomery, Tuskaloosa was the commercial center of West Alabama. Not a little, perhaps the most, of this progress was due to the Warrior River, before the days of railroads one of the most important waterways of the State. In 1835 the first bridge spanned the river at the point where the present elegant structure stands. The removal of the capital was a sore blow to the city. Many families which had made it their home followed the State government to its new seat; but Tuskaloosa’s spirit could, at that time, not be broken. Immediately afterwards, in 1846, a stock company was organized and a cotton mill constructed and operated till the war. 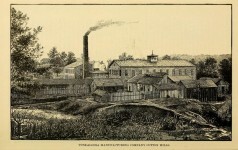 A foundry and machine shop was built in 1848 by Leach & Avery. Plows, and other agricultural implements, which soon acquired a wide-spread reputation, were the principal goods manufactured, but many other pieces of machinery, and during the war even several canons, left the establishment. During that time a hat manufactory was run in connection with the establishment, and many thousands gray hats left Tuskaloosa to cover the heads of Confederate soldiers. In 1858 the watchman of the foundry was murdered and the establishment set on fire to conceal the crime. It was at once rebuilt, only to be again reduced to ashes by Federal soldiers, under Croxton, in 1865. A paper mill, now used as a warp and thread mill, was erected about the same time and successfully operated until the end of the war. Phoenix-like, the foundry rose from the ashes for the second time, under the name of S. J. Leach & Sons, Mr. Avery having in the meantime died. But, in 1879, it was transformed into a cotton factory, under the name of Tuskaloosa Cotton Mills, owned by a stock company, of which J. H. Fitts, Esq., is president. The mills have been making money and constantly enlarging their capacity, even during the dullest times, and last year declared a dividend of 20 per cent. They employ now 150 hands, run 170 looms, and produce 54,000 yards of cotton plaids a week. Their capital stock is $40,000. 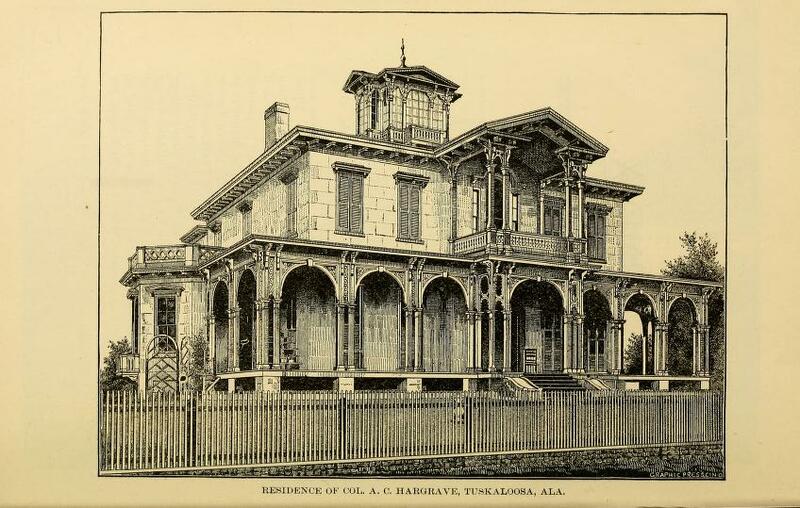 The illustration below is of the residences of Col. A. C. Hargrove, erected in 1856 by Robt. Jemison, Esq., one of the most enterprising, energetic and patriotic citizens of which Tuskaloosa ever boasted. The mansion has a very interesting history about slave tunnels as seen by the following three videos made by Matt McCoy of WVUA in Tuscaloosa. LOve all the history you post! 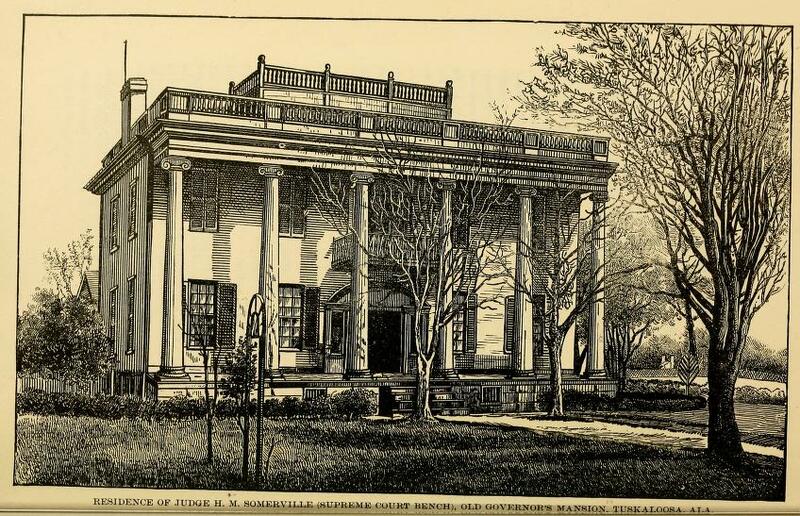 Donna, where did you find the illustration of the old Governors Mansion in Tuskaloosa, used in the article on Slave Tunnells – thanks! -David N.
The pictures are drawings from the book listed in the Sources at the bottom. Brandon Prescott …..You will like this. I’ll have to read this. I went to Grad school in Tuscaloosa! Here Ya go Teresa Baier. The other article that talked about Choctaws originally living in the area that later became Tuscaloosa. Made me wonder if the Moundville Indians were a different tribe or related to the Choctaw? Hi Pamela, the Mississippian Indians living at Moundville predate the Choctaw Indians by several hundred years. But they could be related. We don’t know for sure. 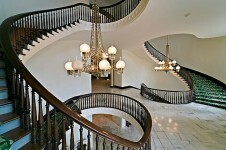 I attended a wedding in this old home and toured all of the ground floor, it is beautiful went up to the top tower. Angel M Smith have you read this? I haven’t read it yet, but I saw it. 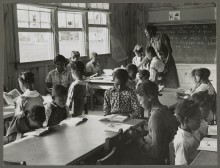 I love these stories of Alabama.Want to read about the 2 female schools of that time. N, this is about the Jemison House. oh cool can not wait to read it. This is not far from where I live! Interesting!! Not true all that was found was sewer system ……. I’m glad to know it’s not true because if it were they would make them tear the house down because it’s offensive to someone. If it were true I wouldn’t want and I’m sure others wouldn’t want this to be torn down. It would be great to know that my African ancestors were able to escape the brutal and evil slavers. Myth most certainly NOT busted. Not by a long shot. I have been in the tunnels. They were just looking in the wrong place. You cant just point to a hole in the ground and say, “Look, this is just a hole in the ground. Therefore there are no tunnels under Tuscaloosa.”. All this means is that this jabroney reporter doesn’t know where they are. I’ll tell you where one entrance is, but it was sealed off a few years ago. Go to the northwest corner of Reese Phifer Hall. On the side facing University Blvd, there is a flight of stairs (about 15 steps) going from a second story door down to the University Blvd sidewalk. This flight of stairs is flanked on either side by two more flights of stairs which take you back toward the building and down another 5 feet or so. Go down the these stairs and turn back towards University Blvd. You’ll be looking at a wall under the first flight of stairs with no distinguishing features other than a small rectangular panel in the middle (roughly 2′ x 3′). That panel covers up a door that used to enter into the tunnel which runs directly under University Blvd. Up until about 6 or 7 years ago, that door was exposed. But now you’ll just have to take my word for it that it was there and that there is definitely a tunnel running under University Blvd directly in front of the stadium. You are a Print Medium, so print the Story! I heard this story when I was a child. I am a descendent of William Henry Jemison, younger brother of Robert, who built this house. All wrong … These tunnels sent sewage to the river … They dumped everything in the river! The Jemison Mansion had indoor plumbing, very advanced for the time. So did Bryce Hospital and it all went into the river. Pollution much? The story I heard was that the tunnel(s) connected the town house to the plantation house across the river. For what purpose, I don’t know. There very well could have been indoor plumbing at the town house. I wonder if the house plans still exist; that would solve the mystery of one or two tunnels !! !